We’ve all been there, trying to assemble some furniture, setting up a computer, or installing something at the house. It might seem easy in theory, but when we’re left with an extra screw or error messages, it takes double the effort to fix the original mistake. When it comes to full building wiring, those mistakes can cause real damage to equipment, with additional costs and wasted resources. You can count on The Connect Group to complete installations with a team of trained professionals. Our staff has worked with various types of structures, from hospitals to schools, office buildings to public facilities. They know the different requirements, building codes, and potential hurdles of each situation. Maybe you’re located in a very old building? We can work around those limitations. Moving into a brand-new campus? Let us design your network infrastructure to ensure optimal performance and connectivity. Because cabling isn’t just about supporting the equipment you currently use but also adjusting to voice, data, and other IT performance requirements for years to come. 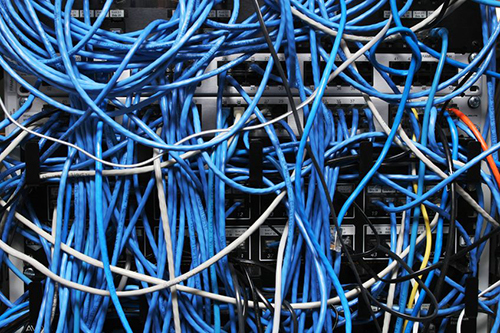 You might be wondering; can’t we just leave that mess of cables for another day? Well, imagine if an old cable is frayed and disconnects the power or internet connection to an important piece of equipment, losing vital data and causing massive delays while you search for a repair person. It’s better to have the professionals come in and assess your existing cabling so that these potential problems can be fixed. With our team, you know you’re in good hands.